Great beginning for Yes with this excellent 1969 debut. One of their more overlooked records - it's often disregarded due to it not being part of the classic Yes era, although your prog-loving Yes fan will at least appreciate the closing "Survival". However, that song's not even close to being the album's best - actually, it's probably the worst. The bestsong on the album comes straight away, with the pounding "Beyond and Before" - a song that, like many Yessongs afterwards,runs on Squire's master bass. Also, Anderson is actually excellent throughout the album - he sounds a lot more energetichere then he does on his mantra-like chanting on later Yes records. Tony Kaye isn't a spectacular keyboardist, but he isn'tbad, and Peter Banks is an underrated player - he stands out, especially on the excellent Byrds cover "I See You". AndBruford is...well, Bruford. Faultless as always. What about the other moments on this album? Well, "Yesterday and Today" is pretty much faultless as a ballad, with Andersonperforming a great falsetto. "Looking Around" is kind of unmemorable, bar Tony Kaye's organ. The two "proggier" songs, "Harold Land" and "Survival" are both very unmemorable indeed. While "Sweetness" is a solid ballad. I think that the thirdreal gem on this album is "Every Little Thing", an excellent psychedelic-whack of a Beatles cover - with some memorable guitar and organ lines. Another really good song on this Yes work. The album is certainly worthy of an 8. Apart from 2 poor moments, this album is a rock-solid effort from what was at the time, an ambitious and energetic band. Of course, they would change completely when both Banks and Kaye departed, but at the moment, Yes were a great, fun band, and this album is a better representative of this early Yes period then it's followup, "Time and A Word". 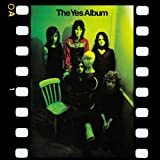 this is the first Yes album (unless you count the first Yes album). their first album with steve howe, guitar God. the first album that's completely brilliant from start to finish. and, it rocks really hard throughout. for me, it's the hardest rocking early Yes album (relayer is more mid period yes). it's catchy too. soemthing the band let slip a little bit in their pursuit of complexness, so it's easily digestible. in fact, "i've seen all good people" was their first hit, and in fact, when i mention yes, most people sing that song! !